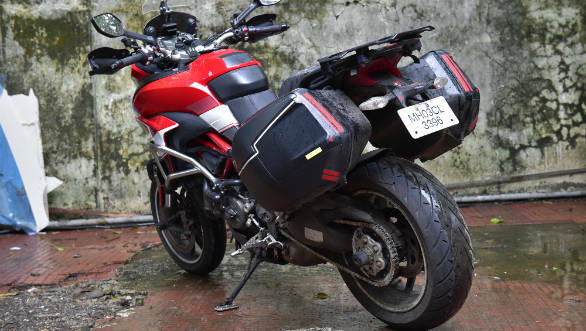 I bought the Ducati's OE pannier set (used, half-price Rs 75,000-odd new) fairly early on. The central idea was to be able to walk in hands-free into an event like a press conference instead of loaded with helmet, gear etc. This works. The 58-litre panniers' left one swallows a helmet, gloves and a bit and the other side gives me an ironed tee-shirt in exchange for a jacket. I'd still have to wear riding pants and boots but this is what I wanted! Over time, I've found that the mounting process for the pannier is easy though it requires a practiced thump to slot into place. 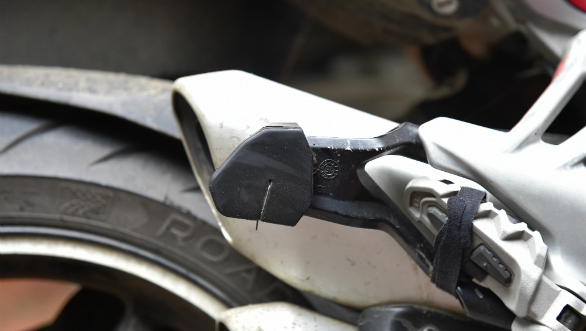 The only hardware added to the bike is a small metal stay that mounts behind the pillion peg. The rubber damper on that can fall off, mine is safety-wired into place. The Ducati's key locks both the mounting and the lid together but you can unlock either separately. I've never had water leak in or found any significant dust inside the panniers either. 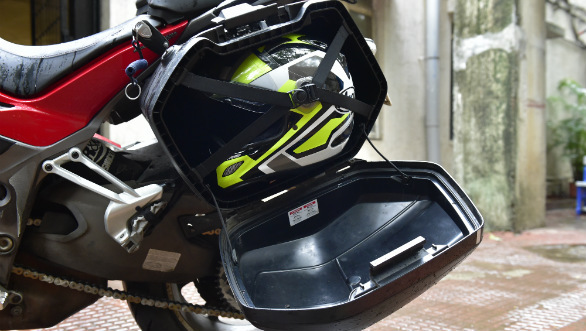 On the move, adjusting the preload (electronically, naturally) seems to ensure that handling isn't affected and Ducati says you shouldn't ride past 180kmph with them mounted. They're slightly wider than my handlebars but I've very, very rarely found a gap in traffic that I might normally use but couldn't because of the panniers. So between their utility and lack of impact on handling, in these 19,000km, they've been on the bike more often than not. I know, I'm surprised too! Are they perfect? No. In time, the mounting allows the panniers some movement - it doesn't cause a problem but I don't like it. The mounting lock tabs are black and that makes it hard to visually verify that they're in place. On the morning pre-flight check, the mounting tabs are the only thing that needs you to fish out a phone-torch. You also have to be extra-cautious with the lock when the panniers are full. If the lid is pressed into place, the lock turns reluctantly and I have on one occasion, pulled the lock cylinder out by mistake. It was easy to slot it back in, but you've been warned. But my biggest grouse is a design issue. Once you add the Rs27,000 (I know, expensive) keyless filler cap, the pannier locks are the only thing you actually need the key for. I know it sounds like a first-world whine, but a fully electronic-locked Multistrada would really be the bee's knees. Last update: New tyres, new grip pads, pillion rides and yes, new lights!